Watch video of Randy Browning discuss his success with GAR genetics. Randy Browning can do a lot more than simply assume he is making genetic progress using Gardiner Angus genetics. This Appleton City, Missouri producer has extensive records which document sizable herd improvements during the past decade plus. 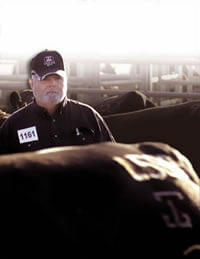 From a herd that started out with significant Continental-breed influence 15 years ago, Browning has consistently incorporated GAR genetics (regularly purchasing bulls and commercial females), transforming his cow herd into a productive bovine factory capable of both excellent feedlot performance and consistent carcass premiums. His calf crops today feed better and grade better, leading to value-added improvements of $111.50 per head greater than when he started keeping records in the second half of the 1990s. The table below presents detailed information about how successive Browning calf crops have performed in the feedlot and on the USPB grid when they were harvested at National Beef in Kansas. Actual carcass data was applied to a recent week’s USPB grid (11/22/10) to make apples-to-apples comparisons on all three groups of Browning cattle. The three time periods shown represent years before GAR genetics were used (1996-2000), years with some GAR genetic influence (2001-2004), as well as recent years when calf crops were approximately 90% GAR genetics (2005-2010). 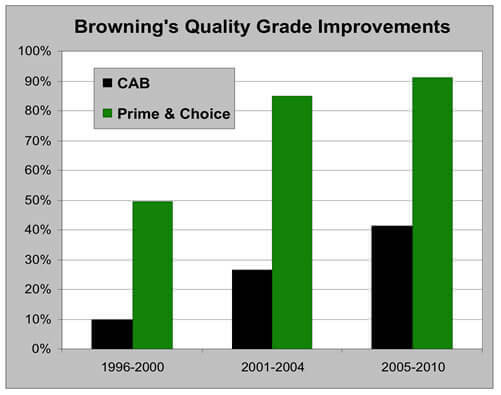 Carcass Performance: Browning’s 1996-2000 cattle might have been considered industry average at the time. They graded 50% Choice and 50% Select, and earned small grid premiums at best. Today the picture is much different. Browning has top-quality cattle earning consistently large premiums through USPB and National Beef. Quality grades have improved to over 90% Prime and Choice, with only a modest increase numerical-average yield grades. Certified Angus Beef carcass qualifiers have gone from 10% to over 40%. Carcass yields (dressing percent) have also inched upward. The combined result of these improvements adds up to +$55.14 per head for Browning’s 2005-2010 cattle versus those he produced a decade earlier. Value Added Trail Blazer: Randy Browning may not have set out to be a value-added leader in the U.S. beef industry, but that is what he has become. This Missouri producer’s documented progress measured at $111.50 per animal is an example many commercial cow-calf producers can learn from and follow on their own path to producing higher value, more profitable cattle. Mark Gardiner recalls his first conversation with Randy, “Randy asked how much performance he would have to give up to improve carcass merit. His recordkeeping proves what we have always believed–we can have it all!” Gardiner Angus Ranch is pleased to have been a partner with Randy on his successful journey, and look forward to continuing this relationship in the years ahead.